It’s not an odd thing for a film to affect me emotionally. Anyone who knows me knows that it happens all the time. But there’s something exceptionally affecting for me about Humble Pie. As I mentioned in my Facebook impression, I so wish I couldn’t relate to the events in this movie. Humble Pie is a completely fresh and uplifting look at a life considered by many to be ordinary. Hubbel Palmer wrote and starred in the lead role. Hubble plays Tracy Orbison – an early 30s supermarket worker living in a somewhat quiet midwest town who happens to be overweight. The reason why Humble Pie struck such a chord with me is that it deals with being overweight in the accurate way that I and others knew and have known life to be and not in a fictional “Hollywood” sort-of way. The “Hollywood” way would be to poke fun at his weight in a Nutty Professor or even Shallow Hal kinda way – then justify it with a moral at the close to remind people that it isn’t important ‘that these people don’t look like us – the key is what’s inside!’. Sadly, little is ever done in these films to convince the viewer that their lives are remarkable. I love Tracy’s character. He lives amidst a mother who makes him feel as if he’s the biggest liability she has in life. 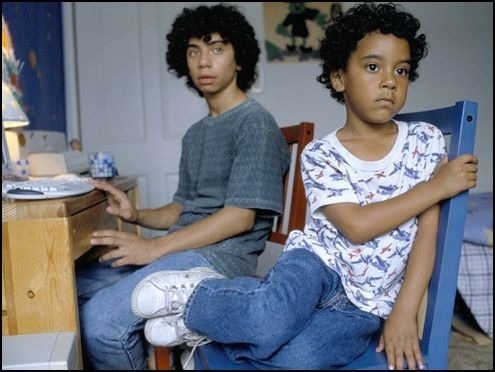 Tracy finds comfort in the relationship that he has with his sister, but being that she isn’t overweight (and, in fact, almost no other characters in the film are overweight), it’s very difficult for him to find anyone who can relate to his situation. 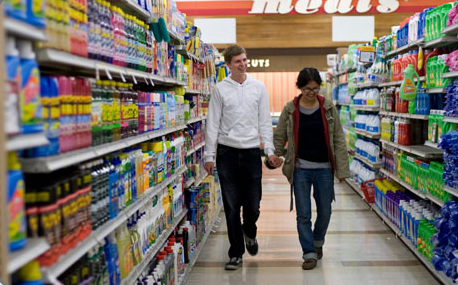 Tracy finds hope in life through his job at the supermarket. And this is the beginning of what makes his spirit kinda awesome. There’s nothing particularly exciting about his job. But for eleven years, he works consistently and comes across as a pretty dependable person. When he finds out that he’s being promoted, his reaction to the glimpse of sunshine in life has to make you smile. Tracy really begins to find hope when he discovers an actor (William Baldwin) in a local performance of a play and identifies with the way in which he commands the stage. Tracy discovers that the actor teaches a local acting class and decides to sign up and follow what he feels is his new purpose in life. If you watch this film and are or have ever been overweight, there will be more than a few moments that I would imagine have drawn a laugh from some crowds, but will draw upon some pretty dark moments. This film inspires hope for those who persevere. No, there’s no montage where Tracy gets a workout tape and changes his eating habits and begins to exercise. And no, there isn’t aren’t any makeover scenes or other significant life changing events happening here. But the film did leave me with this: that despite how cruel some of his family, his friends, his co-workers and just random people he encountered were to him, his attitude remained even. There were so many opportunities for him to just flip a table or punch a wall (or a person). And theatrically, he would have been completely justified. But through it all, he just plays this overweight, gentle six-foot beautiful spirit who’s trying to make the best of a situation that he doesn’t find particularly limiting. It’s the behavior of the people around Tracy that makes life uncomfortable. As mentioned, there were a lot of situations in the film that I truly wish I could not identify with. I watched with incredibly mixed emotions. There’s a script that I have been slowly writing that was trying to get to the heart of some of the things that I would imagine that Hubbel experienced and successfully wrote about in Humble Pie. And there are a bunch of things in my yet-unfinished script that weren’t explored in this film. But this film deserved more attention and I hope it finds new life on home video. Having lived through some of the things that are in the film, it was painful but therapeutic to witness them onscreen. But it’s all worthwhile if you watch this slightly over one hour and a half film. There’s a poem that Tracy reads that was so moving, I had to listen to it twice. If you’ve never experienced disappointment, this probably won’t resonate with you. But for those who live lives that are less than ideal, persevere and endure, holding on until (as my Bishop would say), ‘they feel their help coming’, this poem is a beautiful way to end the film. Humble Pie isn’t the story of every heavier person’s battle to live in a world where they are constantly reminded of their physical differences. But this is a great film to watch and get a glimpse of some of the difficulties that life can impress upon you and the pain you can endure when you try to camouflage yourself among the masses, hiding under dark, loose fitting clothes. Netflix thinks he knows me. He’s always making these recommendations based on other films he’s known I’ve seen. “If you liked Gone With the Wind and you also liked One Flew Over the Cuckoo’s Nest… well, heck, you’re gonna love this one!” There’s something inherently mechanical and artificial about any system that tries to guess whether or not you’ll like a film. Well, whatever the reason, somehow Paper Heart landed in my recommendations list. And I’m starting to think Netflix knows me better than I know myself. Describing Paper Heart is a difficult task. The Netflix description had some word in it like “faux” or “mockumentary” that tipped me off to the fact that this wouldn’t be a completely sincere account of what was to come. It starts Charlyne Yi as herself. Who the hell is Charlyne Yi? Well, she plays this musician/comedian who doubts the sincerity of ‘love’ as a true feeling and decides to couple with a crew to shoot footage in search of a deeper definition. The real draw for most people is the presence of Michael Cera. Cera is an immediately recognizable actor for anyone who has been paying attention to the young semi-independent movie scene for the past three years. He’s probably best known for his work in Superbad and Juno and strangely here he plays… well, himself. The film opens with Yi holding a microphone in Las Vegas and asking passers by about their definition and idea of love. While this may not have been the intent, the insincere reactions that the passers by give to Yi sets her up to be a sympathetic character. As you see her attempts to be taken seriously, you’d have to be heartless not to sympathize with. She’s a 19-year old female of Asian decent, but let’s just say that she doesn’t possess ‘conventional beauty’. After you spend a few moments with her, you sense that her mannerisms are quite odd – leaning heavily towards geeky or nerdy. The fact that she identifies herself as either a comedian or a musician is strange considering that she didn’t seem to take the music that seriously and her comedy even less so. All this said, I really grew to like Charlyne Yi. Her beauty manifested itself in her freeness of spirit. For me (as is the case with most people) a beautiful or ugly spirit drastically either enhances or detracts from your physical beauty anyway. I liked Yi’s personality so much that I’m hoping her role in the movie was close to her real life persona. It would be nice to think of how the world would be if there were more Charlyne Yi’s in it. The film develops with Charlyne subtlety and repeatedly (but not begrudgingly) expressing how she probably won’t ever experience true love. To say she’s pessimistic about her love life is an understatement. There’s even a shot of her parents on film trying to uncover the mystery of her love life. To the viewer, it should be pretty obvious why she isn’t with a beau. She has a strange and almost ‘performance-actor’-ish kinda personality. As if she’s just kinda making it up as she’s going along in life. What makes her likeable in the film is the genuine feeling she gives when she smiles. Throughout the film, she finds small opportunities to create fun for herself. She’s not overly concerned with her appearance. (In fact, she’s not concerned with it in the least.) She strikes me as a person who would randomly utter the most unpredictable and strange comments. And it’s with this free-spirited approach that she and fellow filmmaker Nick Jasenovec set out to interview people about their definitions and ideas of love. The feeling that the mockumentary seems to give us initially is that there really isn’t any script or even a storyboard for how the film will build or conclude. They’re just kinda making it up. That is, until Michael Cera steps on the scene. When I first saw the trailer for The Curious Case of Benjamin Button, I dismissed it immediately. It seemed hokey: a story about a man who would be born with the qualities of an older human and then regress (or perhaps I should say progress) through his life aging backwards – that is to say, getting younger? Complete novelty. I had no intentions of even seeing the movie until it’s DVD release. I happened to be out with a friend and we decided we had enough time to make one of the showings. I’m glad that I was wrong about this film – completely wrong. And I’m a better person for having seen it. The Curious Case of Benjamin Button stars Brad Pitt in the title role, but for me, this was a Brad Pitt unlike I had ever seen before. I myself had been guilty of dismissing Pitt as a shallow actor who imagined himself to be an “actor’s actor”. He took me by surprise in The Assassination of Jesse James by the Coward Robert Ford, and this film presented Pitt in a completely different way. While I still feel that Heath Ledger captured my attention by transforming himself more than any other actor so far this year, Brad Pitt made a last minute run at taking that crown. It’s difficult to describe the plot without taking away from the enjoyment of actually seeing the film (and so I won’t do that.) The best way to describe the film will also be one of the films biggest criticisms: “It’s kinda like Forrest Gump”. I agree that it brings about some of the tender moments that audiences felt while watching Gump. But for my money, Benjamin Button is much more substantive. I’ve always taken flack for my opinion that Forrest Gump was an incredibly overrated film. For me, the 1994 Gump release was memorable for the way that it carried the viewer across a journey spanning several decades, many of which coincide during key events in world history. But to me Gump always seemed more like an ‘everyman’s epic film’. The coincidental happenings set against icons that were typical of each era and decade made the film kinda campy. Benjamin Button is truly epic, and not just because it spans several decades as well. Where I felt that the character of “Forrest Gump” gets overshadowed by the events of the film, the events in Button act more like they should – a setting or a backdrop for the film and the focus is more more squarely on the characters. Actually there are many more coincidences that this film has with Forrest Gump: the hometown girl who steals his heart, the charming loving qualities of the lead actor, the ‘fish out of water’ sequences. Let’s just say that both films have their redeeming qualities. Yet for me, Button has the soulful substance that will insure that I’ll be watching this film a few times. OK, I guess I’m obligated to give a bit more about the plot than just to say it was kinda like another film. As mentioned, a child is born in a state that makes his physical body incredibly old. He has all of the qualities of an older man. But strangely as time moves on, his body gets younger at the same rate that a normal human’s body will age. And the rest of the film reveals the developments of his life: who he meets, who he loves, who affects his life and the lives of those that he affects. This is a tender film and the best way to appreciate the progression of the story is by watching. It’s rare these days for me to add a movie to my Netflix queue on the strength of the trailers that come at the beginning of other rentals. It feels like a zero sum game to keep adding movies. My OCD tells me to finish this queue and then add a bunch more movies later. But something about the trailer for The Visitor made me suspend that policy. I don’t even remember what it was, but somehow it affected me. It seemed like it would do what I’m always looking for movies to do – give me a different perspective. The disc showed up in my mailbox on Friday and now after having experienced it, I’m better for it. This might be the most engaging and original film experience that I’ve seen in the past few years. The Visitor stars Richard Jenkins as Walter Vale – an introverted professor who lives in Connecticut in solitude and in the shadow of his recently deceased wife. The college calls him to make a trip to Manhattan to attend a conference and despite his resistance, he’s forced to go. Upon arriving in the apartment that he and his wife called their own in New York, he quickly realizes that he’s not alone. He awkwardly stumbles across a couple (Tarek and Zainab) who are not from New York (or even from the United States) who had been living there for months. And the story progresses from there. As the story unfolded, I had this feeling that it would somehow play into every modern day stereotype about people not from this country. Tarek (played by Haas Sleiman) is of Syrian descent and is Muslim. I kept bracing for the unveiling that he was here as some part of terror cell. Or that he had some link to it. But refreshingly I don’t even feel like I’m spoiling in revealing that while the events of September 2001 affect the lives of everyone in this movie, none of the characters have even a remote attachment to the things that helped to cause it. This movie has a magical quality. Often you’ll see strangers who are forced into situations where they need to learn to like each other and it just feels fabricated. But the friendship that Tarek and Walter have is completely genuine. It’s infectious. Richard Jenkins is phenomenal in his ability to portray a man who is visibly barren. While he has a beautiful home and a job that allows him to teach only one class and conduct and independent study in preparation for the writing of a book, he’s completely devoid of life. Tarek is the absolute opposite of this. He has nothing, yet his smile and his happiness reach out through the screen. I caught myself smiling several times during the interactions between Tarek and Walter. 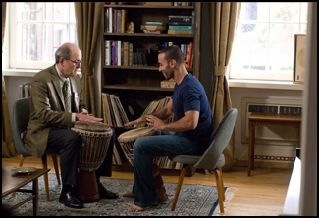 In my favorite scene in the film, Tarek (who is a musician) leaves his drum (called a Djembe) in the apartment and somehow Richard comes home from his conference early and sees the drum. It calls him. He sees it and tries to resist. But he can’t. He takes the opportunity to try his hand at the drum and somehow Tarek finds him playing. While the introverted Walter finds himself apologizing profusely, Tarek makes him feel at ease and the two partake in a drum session/lesson that is rhythmic, funny and hopeful. It is this scene that acts as a microcosm for the entire film. If only more people would share their culture with each other (and not just in one direction), how incredible would this world be? This movie could have taken the easy way out and thrown in a heavy musical score to try to evoke emotion. There isn’t any reason to do that here. The music that is in the film already acts as an incredible soundtrack. This may sound a bit extreme, but for me this is more than just a five-star film with incredible and original performances. This is a film that represents the hope of a nation. There are so many contradictions in American society today. We seem to have forgotten the hope of Ellis Island in exchange for our fear of terrorists. I believe that we need to keep the nation free, but it’s the diversity that makes us strong and expands our world view. If we could all find friendship in folks who aren’t like those we are accustomed to dealing with, it would make the world a better place. When you say the word ‘diversity’, it has come to evoke a sense of resistance. “To force other cultures upon us in the hope that we’ll be more tolerant.” But somehow we missed the real strength. It is meant to be an opportunity for the exchange of customs and ideas. It’s an opportunity to expose a part of ourselves – our music, our language, our ideals. If you leave this movie with anything less than an uplifted heart, somehow you missed the point. Don’t be like me – add this movie to your queue of movies to see without hesitation. After having seen this film, I’m in the market for a Djembe. Shopgirl stars Claire Danes as Mirabelle – a twentysomething glove sales attendant at a Saks Fifth Avenue in California with a somewhat uncertain future. Also starring as her love interests are Jason Schwartzman and Steve Martin. Claire, as always, is quite dashing. Aside from her physical attractiveness, she projects a personality that is profound; she seems like the type of girl who you could really get to know on an intellectual level. I didn’t have a problem with ‘Mirabelle’ as much as I did her choices (but more on that in a bit). Where I did have a problem was with the other casting decisions. Steve Martin has been trying his hand at this ‘serious actor’ thing for quite some time (L.A. Story, Grand Canyon) it just never worked for me. When I see that face, I just want jokes. Be they flatly delivered exaggerations or blunt SNL-style humor, that’s what I find myself looking for. That isn’t to say that I’m so unforgiving that I won’t allow an actor to range outside of the roles I’m accustomed to seeing him in. I think Jim Carrey has done a phenomenal job in his non-comedic roles (and I’d like to see him in many more serious films). But Steve Martin as the straight man just doesn’t do it for me. He didn’t in other films and he definitely doesn’t here either. “Don’t judge a book by it’s cover.” We hear this often – yet when we go through Borders, it’s the covers that are so prominently featured. And when it comes to my selection of movies, sometimes this is just what I do. Actually, to be more accurate, in the case of Me and You and Everyone We Know, I chose a ‘movie’ by it’s ‘title’. Everyone who knows me knows I’m a sucker for a good romantic comedy. Netflix makes suggestions based on movies I’ve seen. When this title showed up in my list of suggestions – for some reason I just had to add it to the queue. And only now after seeing it do I realize that it’s not exactly a romantic comedy in the “Serendipity” or “Notting Hill” sense of the phrase. It is much more akin to Garden State or The Squid and the Whale – both of which I loved immensely. On Wednesday night, I found myself with some time and a stack of 5 Netflix films. The only reason why I chose this film was because of it’s short runtime (about an hour and a half). After having seen it, I’m certain that this will probably end up being the best in film in the stack of films that I have to watch – and it may quite possibly be the best film that I’ve seen all year. It’s difficult to categorize Me and You. It has elements of romance, but it’s not by any stretch of the imagination a true romantic comedy. It’s got some dark comedy elements, but it’s not in any way approaching the edge that Todd Solondz goes over. And while it has elements of drama, it’s not a traditional drama either. So what exactly is it? Me and You has the “Independent Films Channel” credit before the film plays, and this is completely appropriate. The best way to describe the film is that it is an independent film. And this is a good thing. It’s independent in many ways, but mostly in the way that I like – this is a completely original cinematic experience. It’s strange. It’s unpredictable. And if you finish the film, it’s rewarding. It isn't odd that he's looking at her peculiarly. Or that she isn't looking back at him. Not quite sure why I was persuaded to click the “Add to Queue” button for 2 Days in Paris. Maybe it was the typical romantic comedy image on the box? Perhaps at the time I saw Julie Delpy’s name and remembered how much I enjoyed the two other films I’ve seen her in – Before Sunrise and Before Sunset. Whatever the motive, it showed up on Wednesday in my mailbox. Sunday is always a good day for a romantic comedy for me, and so I popped it in. The first thing I saw was the ‘Red Envelope Productions’ logo – a sign that the film is probably lower budget than normal, as this is the Netflix film production company. So far I’ve seen two or three of their films and each one has been a bit informative, but lackluster and often times a bit too politically slanted. It took some motivation, but I stuck it out. And in the end, I’m somewhat happy that I did. 2 Days in Paris stars Julie Delpy and Adam Goldberg as a couple who, having just left from Italy, are going to spend a few days – you guessed it – in Paris. Adam plays Jack, who is not only the typical American, but the typical “new yorker” in Paris. He’s a rather annoyed guy. The type to tell the movie theater attendant that it’s a bit too chilly in the theater. This doesn’t help his plight much, as Julie Delpy plays “Marion” – his girlfriend for two years in New York who, as he begins to discover watching her in her natural habitat of Paris, might not be as faithful as he first believed. This movie annoyed me a bit at first. For one, it plays into all of the stereotypes about “Americans in Paris”. We’re always bothered by their carefree lifestyles. Stuck up and too uptight. As we watch the plot develop, at first Jack seems a bit insecure. However, (being a bit insecure myself), watching the story play out and watching as Marion has random French conversations with acquaintances, you begin to get the sense that Jack may be on to something. Even at only an hour and a half, the film seems to drag a bit. It’s somewhat depressing to see that this couple doesn’t seem to have the chemistry that they think they do. You keep watching through peered eyes for the train wreck to happen.